In Bloom, a conference sponsored by Antioch University New England, Saturday, April 27, 2019, Kittery, Maine a keynote entitled Creating Outdoor Spaces that Connect Children to the Natural World along with a hands-on building session where we will create a bower using harvested invasive plants. More info here. Book Talk: on Sunday, May 5, 2019 at 1:30 pm at Tower Hill Botanic Garden, Boylston, Massachusettes. More info here. NatureCity Forum at Brookside Gardens in Wheaton, Maryland on March 26, 2019 is a full day exploration of green infrastructure for climate resiliency, community building, human health and ecological benefit with designers, practitioners, planners and advocates. Sponsored by several regional organizations including NOAA, NWF, Chesapeake Bay Trust, MRPA, US Fish and Wildlife. Nancy was a featured speaker giving a talk entitled Parks, Nature Play and the Next Generation. Shema Koleinu – Hear Our Voices Jewish Federation Early Childhood Conference, Rockville, Maryland. December 13, 2018: A talk entitled: The Voices of Nature. Project ACT’s Annual Conference: It’s Easy to Be Green. Presented by Abilities Network, Project ACT and Community College of Baltimore County. Saturday, October 6, 2018: A talk entitled: Creating Earth-friendly, Child-friendly Nature Play and Learning Spaces. Antioch University New England, Keene, NH: October 13-14, 2017 Nancy taught: Landscape Analysis and Design of Nature Play and Learning Spaces a course in the Nature-based Early Childhood Education graduate program. Antioch University New England, Keene, NH: October 15-16, 2016 Nancy taught: Landscape Analysis and Design of Nature Play and Learning Spaces a course in the Nature-based Early Childhood Education graduate program. EarlySpace will be at booth 116 in the exhibit hall as part of the Seneca Creek Collaborative. on Friday, March 14 at 11 am. 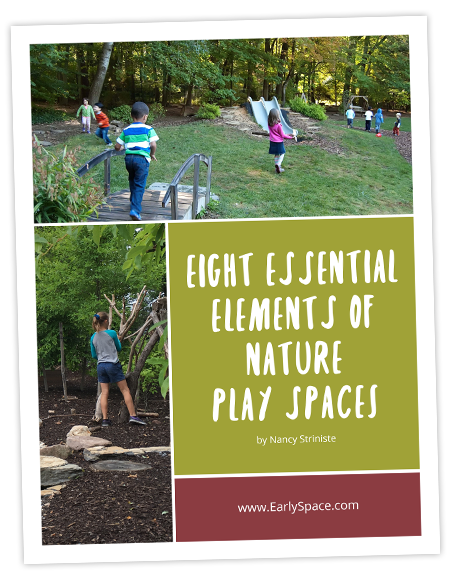 Nancy spoke on The Managment of Natural Playspaces: how to program and care for your natural playspace. Gardening for Children with Autism Spectrum Disorders and Special Educational Needs, July 11, 2013, Arlington, VA. The program will feature a discussion of the book, Gardening for Children with Autism Spectrum Disorders and Special Educational Needs, by Natasha Etherington. Reading of the book is optional. The discussion leaders include Elenor Hodges, Nancy Striniste and Mary Van Dyke of NoVA Outside, and April Rosenthal, the Therapeutic Recreation Programmer of the Arlington County Department of Parks and Recreation. VAECE Annual Conference: Nancy, along with colleagues Sandra Redmore and Sissy Walker, gave a talk entitled Designs, Strategies and Curriculum that Promote Outdoor Learning. VAECE Annual Conference, (February 14-16): EarlySpace designs were on display in the exhbit hall all weekend! Earth-friendly, People-friendly Landscaping, a talk by Nancy Striniste, on Feb 23, at Lynchburg College’s Sydnor Performance Center, (Schewel Hall), in Lynchburg, VA from 7-9 pm. Sponsored by The Central Virginia Master Naturalists and the Central Virginia Environmental Education Alliance, in cooperation with the Naturalist Program of the Lynchburg City Parks and Recreation Department. Early Childhood Outside: Lens on Outdoor Learning, Saturday, April 13, 2013 at Fairlington Preschool, Alexandria, VA.
We could have spent about the same amount to add just one room onto our house, instead our whole property was transformed. We have a wonderful outdoor living space with beauty everywhere I look. I never want to go inside!